If you're fishing a salmon beat during the Spring months and there's isn't a professional ghillie around to advise you where to pay particular attention look out for bunches of daffodils or snowdrops on the riverbanks and understand their probable significance. The old school ghillies of Scotland were astute enough professionals to mark their main Spring salmon lies with bunches of snowdrops during the very early Spring when the snow & ice was present on the Scottish riverbanks and daffodils in the milder months of middle to late Spring. If you really think about that you'll fully tune in to just how professional these career men actually were and how considerate to give their guests that 'precise' Spring salmon lie insight whether they were personally present on their beats or not. The daffodil isn't regarded as a native species to Scotland as they were introduced from England & Wales but they are not regarded as an invasive species unlike other plant life that can take over the river environment and cause all sorts of ecological issues. As salmon lies can change and adjust in certain terrains of the river valleys a daffodil salmon lie 'marker' can easily be moved with a spade and a couple of pales if an adjustment needs to be made following a big flood where any salmon lie naturally alters. 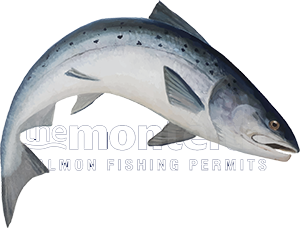 As Spring salmon fishing becomes more and more popular it would be beneficial for anglers to be given a few extra target areas on beats where there's not a full time ghillie or when the beat ghillie is booked in the boat or as a personal guide to another guest. As a professional ghillie I know fishing guests will pay far more attention to a 'blast of yellow' on the riverbank than the easily forgotten salmon fishing pool advice that's been issued that usually goes straight over their heads due to the excitement of being back on the river! Most of our Scottish salmon pools have been named due to meaningful landmarks on the immediate riverbank area for example 'The Castle Pool' 'The Junction Pool' or 'The Oak Tree Pool' which is all fine and dandy but that extra level on pool knowledge for a visiting fisher who isn't completely aware of the Spring month hot spots within that pool would be an obvious and effective advantage. When you're on form with the fly and 50 yards away and closing from a bunch of riverbank daffodils let your hackles rise naturally in anticipation of that special subsurface hello!